This blog focuses on the confluence of style, culture, and sustainability, and I personally avoid items made in unfit conditions by polluting companies, down to even my razor and underwear. However, when it comes to the environment, do most Americans incorporate their values in their daily interactions? According to a recent Gallup poll, most Americans do not rank the environment among their top concerns (Gallup, 2016). It’s easy to see why; while the slow burning effects of the warming of our planet will produce catastrophe, the interim decline could appear merely conceptual or abstract when contrasted with visceral, immediate problems like personal debt or job security. One way to challenge this perception is by framing the politicized issue of climate change in a personal way. Focusing on developing small environmentally conscious habits reinforces one’s intimacy with the topic, and ultimately effects great change when done over a long period by many individuals. Conversely, according to a Harris Poll of 2,000 U.S. adults, 78 percent of respondents in 2015 said they would purchase sustainable products, up from 75 percent in 2014 (Svenska Cellulosa Aktiebolaget [SCA], 2015). This indicates that there is still more left to understand about the public’s relationship with environmentalism. So, how interested is the general public in purchasing products perceived to be “green” and how much are they willing to pay for those items? Overall, it seems most Americans believe, in theory, that purchasing environmentally sound goods is a high priority to them; however, there is some evidence of a cognitive dissonance amongst these findings that has not been explored. There seems to be a consensus that young people, specifically Millennials, are more likely to purchase sustainable products than older consumers. A recent Nielsen poll found that Millennials are most willing to pay more for sustainable products, with 72 percent in 2015 reporting the habit (Nielsen, 2015b). Yet another Nielsen poll found that 51 percent of those Millennials who respond well to sustainability are swayed most by the packaging of a product and the indication, or lack thereof, of corporate responsibility (Nielsen, 2014). The majority of those who purchase sustainable goods are young people, with 24 percent of Americans aged 18-34 indicating that most of their purchases are green (SCA, 2015). That’s not to say that older generations ignore the environment. 51 Percent of baby boomers, Americans between the ages of 50 and 64, are also willing to pay extra for sustainable goods (Nielsen, 2015b). 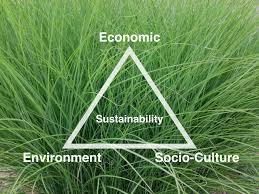 Only SOC found a link between family structure and sustainability. While the poll has some flaws, including that its respondents were selected from a group that chose to participate, the information the poll presents indicates a fascinating and under-reported trend. Of those who purchase green products, they found that 26 percent of those with children under the age of 18 indicate that a majority of their purchases are sustainable, while only 20 percent of those without children do the same (SOC, 2015). Their reasons for “going green” also vary. Only 41 percent of those with a child under the age of 18 buy sustainable products because it helps the environment, while 52 percent of those without are motivated by global warming (SOC, 2015). Because those with children are more likely to consistently buy sustainable goods, but are overall less motivated by environmentalism, there must be other factors at play that have yet to be quantified. While demographics tell part of the story, other variables affect one’s attitudes and habits – perhaps most poignantly are societal norms. In a study in Psychological Science, Dr. Eom and his team of researchers found a high correlation between personal environmental action and the value of individualism (Eom, Kim, Sherman, & Ishii, 2016). In collectivist cultures, those that value the group above the individual, they saw almost no correlation with personal concern and action, yet if one were to be convinced that the majority of his or her group makes environmentally sound choices, they are much more likely to act (Eom et al., 2016). While their study focused on a national scale, their findings can be extrapolated to subgroups and immigrants in the U.S.
Alternatively, Nielsen (2014) found in a study of global online consumers that “The propensity to buy socially responsible brands is strongest in Asia-Pacific (64%), Latin America (63%) and Middle East/Africa (63%). The numbers for North America and Europe are 42 and 40 percent, respectively.” These findings, when considered with the cultural implications, might reveal that while collectivist societies are less receptive to traditional appeals to personal concern, they are more likely to act when environmentalism becomes the norm. Dr. Eom and his team found that the U.S. was by far the most individualistic country, yet North America ranks second to last in Nielsen’s study of online consumers. This discrepancy is worth pursuing further, as it could lead to finding more effective ways to change consumer behavior. What motivates a person to buy sustainably varies to a surprising degree. As noted above, those with children under 18 are less persuaded by the environmental impact, yet still purchase “green” items. Understanding this is key to finding a message that influences the greatest number of shoppers. Overall, as Nielsen found, among those who choose to spend more on sustainable products, one’s values are more influential to shopping habits than personal benefits, such as convenience (Nielsen, 2015b). SOC’s survey, they found that 49 percent of Americans who indicate that they shop sustainably do so for the environment (SOC, 2015). Meanwhile, 25 percent of Millennials are motivated by perceived health benefits of organic, sustainable, or otherwise green products (SOC, 2015). There is some discrepancy between what these polls are showing. Not only are the numbers rarely unanimous, but the habits shown are in opposition. Take for instance the YouGov survey that found that Americans are the least concerned with global warming when compared to other countries, with only 9.2 percent of respondents citing it as their top concern (Dahlgreen, 2016). This is despite the fact that Americans, as a whole, have a proportionately larger negative impact on the environment than other countries (Than, 2012). In 2012, Americans ranked last in a National Geographic study of global sustainable behavior and only 21 percent felt guilty about their negative impact (Than, 2012). These finding imply that Americans overestimate the effects of their small environmental actions. Nielsen found that 52 percent of shoppers are motivated by “green” claims on packaging, while SOC reports that only 26 percent of respondents can determine whether a green claim is true based on their research (Nielsen, 2014; SOC, 2015). If we are to assume these numbers are true, a quarter of shoppers who want to purchase green products are not making a difference, but rather are easily motivated by clever marketing. Overall, Americans want to be associated with sustainable practices, especially its youth, but the extent to which one will practice these habits is inconclusive. While some studies show that a majority of shoppers are likely to spend more for sustainable goods, most do not determine how much more they are willing to spend. The one piece of evidence available points to a very low threshold of environmental concern. Americans are swayed by green claims on packaging, but most do not know how to verify those claims, and they are the least likely to feel guilt for their polluting habits. We see a country divided. Shoppers want to be sustainable, but many do not fully understand what that entails, and believe their efforts, no matter how small, are making a larger impact than they are. There is still much left to understand about the justification of shoppers’ actions and their true motivators. Some areas that should be further explored include the relationship between households with children and purchasing sustainable goods, and the actual amount shoppers are willing to pay for those products.